When preparing your home to face the cold winter months, don’t forget your home’s foundation, the crawlspaces, and the exterior areas. It’s simple enough to begin; walk around the outside of your home and look closely for any cracks or odd holes in the foundation. Kill and remove any weeds that are against the foundation. Rake away the dead vegetation to prevent it from rotting and molding against your home. Close up any possible entry points for rodents; mice can get through very small cracks. Close and seal cellar doors as tightly as possible. Tightly close the crawlspace entrance(s). If you can take the tight space, you actually should crawl through the crawlspace and look for any rodent infestation or damage caused by standing water. 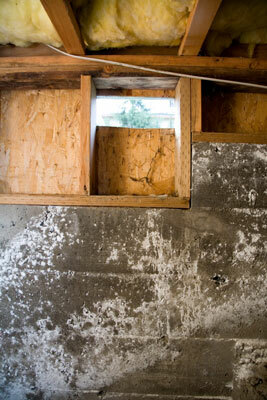 Add insulation to the attic or upper crawlspace to help prevent ice dams from forming on the roof. Seal driveways, patios, and decks as needed. Cover your patio furniture. Put cushions away for the season. Drain and unplug water fountains. Bring plants inside that can’t take the cold. Check the exterior of your garage and out buildings, as well, especially if any them house livestock or backyard chicken coops. Clean off the outside of your air conditioning condenser with a water hose and clean off the blades and coils. Cover your air conditioning condenser with waterproof, but breathable material. Remove any window air conditioning units. These can be stored in the garage until you need them next year. Drain the gas from your lawn mower(s) and any other outside lawn care equipment.